Underwriting identifies your business, products and services as supporting community radio programs on KKCR. Underwriting puts your enterprise in touch with our educated, dynamic audience. to the entire island of Kauaʻi, from Waiʻanae to Waikīkī on Oʻahu & beyond! Underwriting is to community radio what advertising is to commercial radio. The difference, however, is clear: Commercial stations may air as much as 18 minutes of advertising time per hour. KKCR airs less than five minutes of underwriting per hour, which means our underwriters aren't lost in a sea of commercial hype. Underwriting is an announcement of support. While listener members are the major source of KKCR's funding, KKCR also welcomes support from local businesses and other non-profits via underwriting. By underwriting KKCR programs, a business contributes to KKCR operations and is thanked for it during that program. Businesses may underwrite with money or with a trade of goods or services. •	KKCR-FM is the #1 Non-Commercial Radio Station on Kauaʻi! KKCR offers a variety of long and short-term underwriting packages. You may also focus on specific days, times and programs. No additional costs are incurred for production of the underwriting messages. Six + Months Regular Underwriting messages are aired at the top the hour. No more than four are played at a time. Contributions range from $10 to $25 per message depending on the frequency and time they are aired. Long Term Underwriting also includes a listing on our website www.KKCR.org which gets over 8,000 visits each month. An affordable and effective way to promote a concert or fundraiser, celebrate a grand opening, or introduce a new business to the community. Limited term messages, from 1 day to 5 months, announcing a business or event, the location, and how the audience can find out more information. Messages are aired at the bottom of the hour. 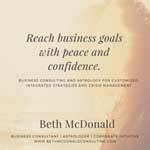 As a Corporate Intuitive, Astrologer and Business Consultant, Beth McDonald helps corporations and their executives design and execute strategies specifically created to empower them meet their goals on time, on budget and in ways that bring them greater peace. A rare talent, Beth is one of only a handful of professionals who work in this realm. For more information about Beth and what she can do for your business and career, visit www.bethmcdonaldconsulting.com, call 805-708-2935, or email her at 1oracle@cox.net. Fun Techniques for Learning to Play the Harmonica!